Often we go into urban shelters and rescue a large number of dogs, but we also get dogs in groups of twos and threes from various shelters, both locally and remotely. Most of our dogs come from local shelters, but occasionally we hear of a dog or dogs who will otherwise be euthanized, so we arrange transport and many dedicated volunteers drive them to us. This page is devoted to stories of some of these rescues. This is a slideshow of our West Virgina Teen Mission Trip! Meet June from the Ritchie County Humane Society. 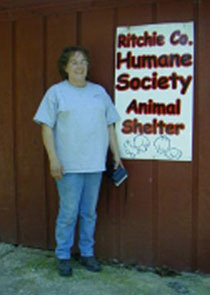 She runs a shelter in WV on a shoe string. To see her dogs, click here. And I've surely passed the test. Though a new dog's come to stay. Some others think I'm great.